Home to an Australian Icon! The American So Cal phenomenon began in 1946 by founder Alex Xydias and revitalized by Pete Chapouris in the 1990's. 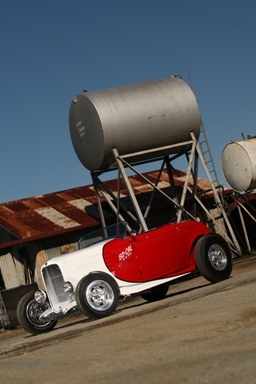 The company produces high quality traditional hot rod parts and building cars to an elite standard. Jimmy Shine joined as a fabricator, but his television presence and racing performances have raised him to become a So Cal icon in his own right. After seeing a model of the So Cal Roadster, her mind was thinking "how cool it would be to build an entire roadster, how hard can it be, It's just a roadster". The plan was set in motion after a lot of "WTH" (edited for the soft at heart) comments from Graeme. He eventually warmed to the idea and took on the project of the roadster with gusto. It took a lot of time after normal working hours, but the team here at Oz Rods were keen to see the finished roadster, and soon the buzz of working on such a prestigious project sunk in. 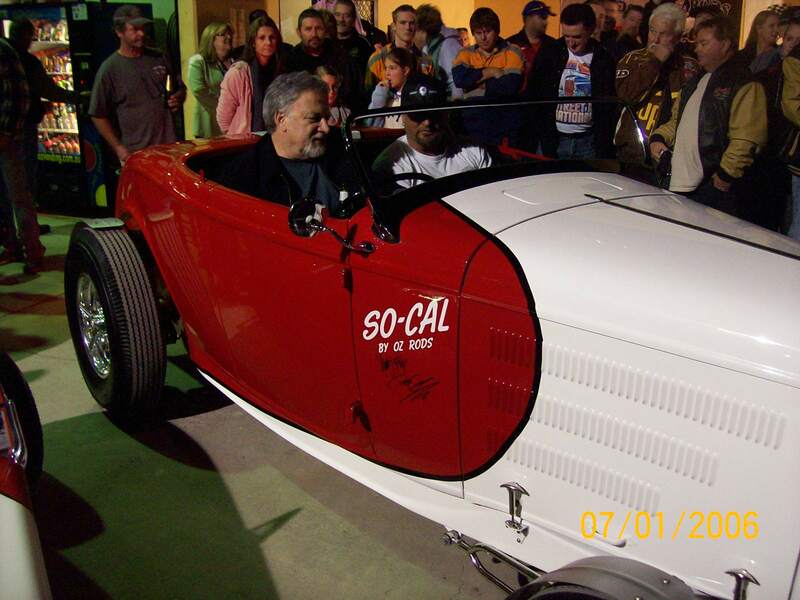 The chassis for the roadster was built at the So Cal Speed Shop in Pomona, then shipped over with the roadster body and additional components in march 2011. The only difference being that the chassis had to be right hand drive. 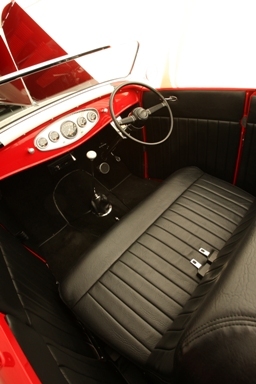 The right hand steering arms were made in the states. It arrived with the pedal assembly, master cylinder and booster, all mounted on the right. 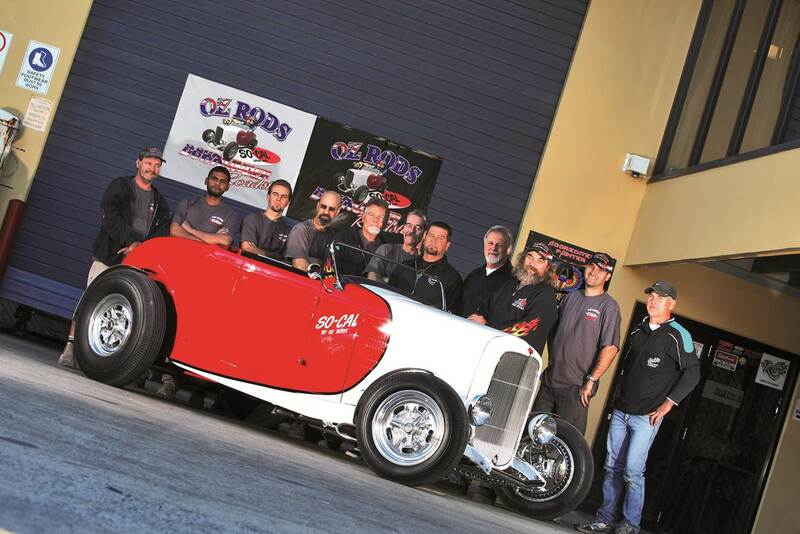 When it arrived, Oz Rods added a HQ steering box before she had her first inspection by the ASRF TAC inspectors. There were minor changes to be made to meet Queensland's rego requirements. The time frame for completion was tough, but we were all excited about the project. They had ten weeks to get her completed for Brunswick. Well, as you can gather, there were a lot of late nights and committed souls on this roadster, but the end result speaks for itself. I think the proudest moment for us all was the unveiling, which was held here at Oz Rods, with Pete and Jimmy in attendance. The night was a roaring success, with music by West Texas Crude, and a committed bunch of amazing helpers. The star of the night was cloaked in secrecy waiting for her big debut. Pete and Jimmy were blown away by the interest this little roadster had caused. 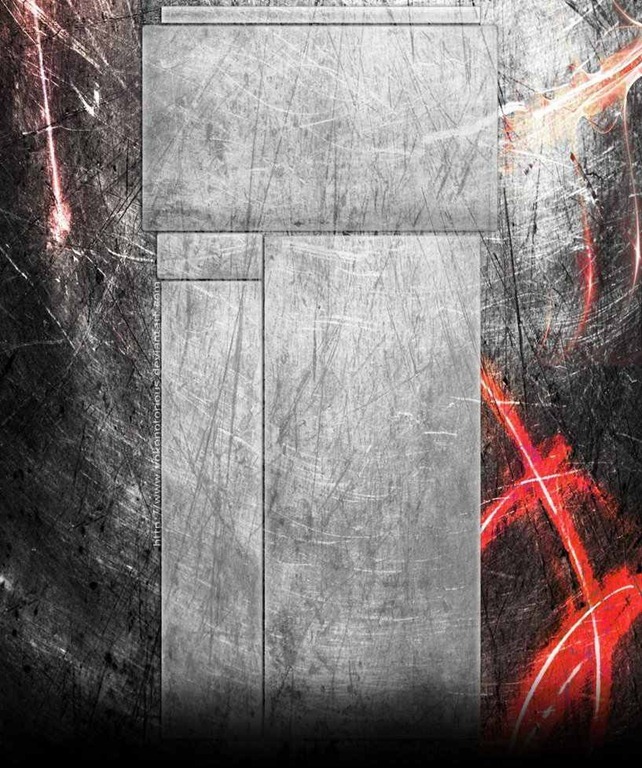 They happily signed the roadster both sides of the cowl, and declared that this was No. 8 in the fleet of So Cal Roadsters, and the only one outside of the U.S.A. They did get a chance later in the night to check out all the Rods that turned up for the special event. The weather couldn't dampen the enthusiasm we had for her first outing. The roadster was safely tucked away in her trailer till the Saturday for the Christmas in July lunch at the Billinudgel Hotel. After an awesome lunch and catch up with friends, the keys were handed to Pete and Jimmy for the drive back. It may have been raining but Pete and Jimmy were in their element. The boys were spotted driving around Brunswick Heads in the afternoon, and on Sunday the Roadster was the feature of the "Show and Shine". Pete and Jimmy extended their stay to do a commercial for Shannon's Insurance at Village Roadshow with our little "Roadster Down Under". http://www.youtube.com/watch?v=BNcwFP3qP64 Click this link to watch the Shannon's Commercial. http://www.youtube.com/watch?v=zZhdH3NZCrs Click this link to watch the making of the Shannon's Commercial. 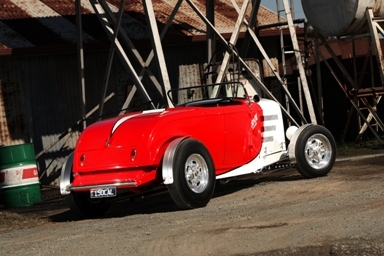 The next big outing was at the Motor Ex in Sydney, where she was invited along with Rod Brewer's half scale 34 Roadster in So Cal colours. The So Cal Roadster Downunder was a big hit at the show, with Pete and Jimmy doing a meet and greet at the stand she shared with Cruzin Magazine. The trip home was not without drama's. 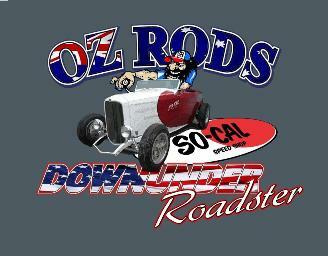 After doing a back axle on the trailer, which meant the Roadster had to be unloaded South of Gosford, and driven home to Oz Rods in Queensland. So in the cold light of day, Graeme nursed a broken trailer home, and Darren drove the Roadster. It was the ultimate road test for her which she passed with flying colours. Darren had a great time driving her, but remembers thinking to himself, "at what point does frostbite set in". It was a memorable time for the Roadster, but she has since made appearances at a few local events and shows.